If you've been to a bookstore lately or have been reading the interviews and book reviews here at LovetoKnow Crafts, you've probably gotten the idea that crafts are getting more and more stylish all the time. People want to be able to create those looks that they see in the stores with their own two hands. It's great to be able to make something yourself that is less expensive than the designer outfits and accessories, and it's even better when someone asks you where you got something and you can proudly say, "I made it myself." LovetoKnow: How did you get started designing altered bags? Genevieve Sterbenz: I was inspired by Judith Leiber's bags and how she seems to paint with rhinestones. I wanted to find a less expensive way to create the same look. LTK: Altering purchased items, from T-shirts to tote bags, is a big part of crafting right now. Why do you think people love to make store-bought items more individual? GS: With stores like Target, Kmart and Payless, high style is now totally affordable. They all have their own designer lines of clothes and accessories. These items provide plenty of inspiration and become "blanks" for people to personalize them. LTK: What makes a bag a good candidate for alteration? GS: It depends on the technique you want to use. With some ideas, you have to go in search of a bag to execute it. Other times, it's the bag that inspires the design. When I wanted to do The Pave Polka-Dot Purse, a purse paved in rhinestones like the Judith Leiber ones, I went looking for a purse with a hard case, just like she uses. But after doing some research, I found that it was easier to apply rhinestones to fabric rather than metal because it allows you to use a less-toxic glue. So when I finally found a bag that had a metal frame and exposed silver metal sides but a fabric front and back-I knew I'd found the best of both worlds. I got the great look of a metal bag, which works beautifully with the clear rhinestones, plus the fabric that made applying the rhinestones really simple. The pink bag I used for the Big City Bowling Bag was a bag I stumbled upon in a shoe store! After studying it I realized that the piping would allow me to inlay fabric. So in this case, the idea was born out of the bag. LTK: Any tips for getting good deals on bags at thrift stores and flea markets? GS: Most people are more willing to negotiate if you buy in multiples, but make sure that what you are buying is well constructed. Even if a bag is battered and bruised it might have a beautiful chain or a big rhinestone clasp. It's the details on the bag that make it worth having, particularly if you are going to alter it. Persistence is also important. I noticed a bag in the window of a local thrift store, but it was a little pricey so I wasn't sure about it. Well, that bag sat in their window for over a month. Finally, I went in and inquired about it. The manager said he never negotiated, but when I mentioned that he had been unable to sell it at his asking price for over a month now, I got to go home with the bag-at a big discount. LTK: What's your favorite project in the book? Why? GS: I have a couple of favorites. 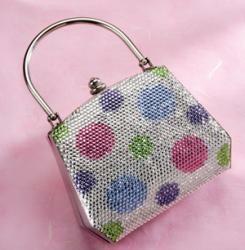 The Pave Polka-Dot Purse was a labor of love. It's not difficult to do, just time consuming. I love The Vintage Rhinestone Purse because I can never get enough rhinestones. And of course, The Miss Kitty Tote because of the vivid colors and how graphic the design is. LTK: Do you do other crafts that don't involve bags? GS: I do many other crafts. I've written eight other craft and home decorating books that include jewelry making, greeting cards, Christmas decorating, candle making and home spa recipes. I've also taught classes, contributed craft ideas to other books and have appeared on television. I do scrapbooking and custom photo albums for events like birthdays, anniversary parties, and weddings for different clients. I've also done decoupage, glass etching, mosaic tiling, and party decorating. I've even made small furniture! LTK: Tell us about the new book. GS: I just finished a book called Bead Style: Fabulous Chunky Jewelry that is coming out in the fall of 2006. It includes 50 designs for necklaces, bracelets and rings. LTK: Anything else you want my readers to know? GS: I would say don't be intimidated! Try any craft that appeals to you. You never know until you start working with different materials what amazing creations you can come up with. I'm one of those women who has never really given a lot of thought to handbags. I want something that's functional and not completely offensively ugly. My last several bags have come from Target. Still, I wanted to look at this book because I thought if a book could inspire even me to think about bags as another way to craft, then this would truly be a good book. And it is. Flipping through the pages, I got really inspired, thinking both "I could do that" and "I'd like to have a bag like that." While I haven't yet had the time to work on any of these projects, there are several that I think I will try. The book offers 26 patterns along with one variation of each project, for a total of 52 different looks to try (a bag for every week of the year, how fun!) if you're truly handbag obsessed. These patterns run the gamut from a ribbon-embellished tote bag (one of the ones I've got my eye on) to a tiny evening bag made out of a feather boa, a travel valise made from a papier-mâché box and a clutch dressed up with a costume jewelry necklace. There's a portfolio, a hatbox bag, an envelope purse, even a "lipstick purse." Some are glitzy, some are girly, some take inspiration from the garden, from folk art, or from an original illustration. Many of these projects use interesting materials such as feathers, pom-poms, appliqués, buttons, a faux-fur collar, sequins and roses made out of ribbon. There are even a few bags you can make entirely from scratch if your stash of store-bought bags is lacking like mine. This book is a lot of fun. It includes projects that are both fanciful and practical, for everyday and your fanciest to-dos. 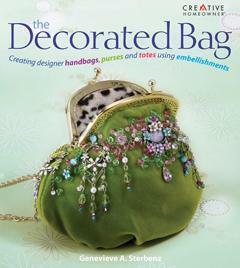 I'd wager there's not a woman out there who can't find at least one bag to love in this book.